We would love to take care of your stay at Moutier-Malcard. The "Veï Lou Quéri" residence and the holiday cottage "Chez Mémé Delphine" are situated in the community of Moutier-Malcard, in the north of the Creuse. 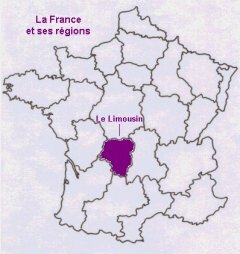 This department forms with the Corrèze and the Haute-Vienne, the Limousin region. The cities of Argenton, Châteauroux, Limoges and Montluçon are within about one hour’s drive. Moutier-Malcard lies a few kilometres from route D940, halfway between La Châtre and Guéret, and on the D990 between Aigurande and Genouillac. Home > Exploratory maps > Itinerary to "Veï Lou Quéri"and "Chez Mémé Delphine"